Planing is a key operation in woodworking. I use hand planes extensively for planing surfaces and edges. Jack planes are excellent for smoothing and evening out flat surfaces. But squaring edges has always proved problematic for me. I have never found it comfortable to use a regular shooting board to square edges of stock. This is a big problem when working with hard woods like Teak and Sheesham.The plane blade does not cut very well and the pressure required to make a clean cut can be quite great. The problem is that unless the edges of stock are planed to perfection, joining operations can go out of kilter. This is esepcially so with dovetail joints that are made with regular dovetail jigs. Squareness is a strict requirement. Perhaps the best option would be to have a precision, high quality (and of course highly expensive) sliding compound mitre saw. Without that a power planer is one simpler and cheaper solution. I decided to use a power planer as a solution to my problem of squaring lumber. There are two models available in India currently and I went for the somewhat larger GHO 26-82 model as opposed to the smaller GHO 10-82. Both models appear to be similar but the bigger model has a larger chipping range or cutting depth. A third model has appeared in the UK with even more chipping depth but has not yet been released here. 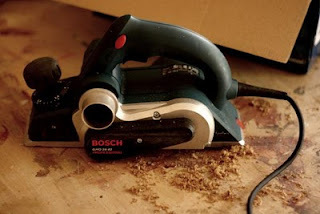 The Bosch power planer comes with a chip bag, which is pretty essential because while planing, the chipper sends out small wood chips flying out of its side. They can make a mess and get into one's eyes. Then there are two guides: one for rebates and the other for holding the planer square against the sides of lumber. The latter is a very useful function because it allows me to make accurate square cuts along edges, even end grain. For added accuracy I usually clamp two peices of stock and run the planer along that with the edge guide. This gives me a pretty good square edge. One problem is that of sniping. Snipe is a slight gouge caused at the beginning or the end of a piece of board as it is being leveled. This can ruin the most carefully prepared piece of lumber and is a major problem with most machine planers, jointers and also with this power hand plane. The woodworker using a power plane must be careful while starting and finishing a planing action. Any wobble in the beginning or end will result in snipe. While starting the planing action, the pressure must be on the front of the plane so that the cutter does not hit the wood at an angle and take off an extra slice of material at the beginning of the pass. During the pass, hand pressure should be even and at the end the pressure should be at the end of the planer so that it does not dip down as it comes off. The other way to prevent snipe is to put two sacrificial blocks of wood at the beginning and end of the peice to be finished. This of course will require a whole lot of extra clamping but it is better to be safe than sorry. The planing quality otherwise is good though it is advisable to do it in small steps rather than make one long deep pass. The controls (see image) are easy and accurate. I hope that Bosch dealers will stock spare blades and dust bags. The planer comes with the following: Dust bag, Stop bracket, Guide bracket, Allen key and Planing knife. Overall I liked the machine even though it lacks a carrying case - it is sold in a cardboard box. 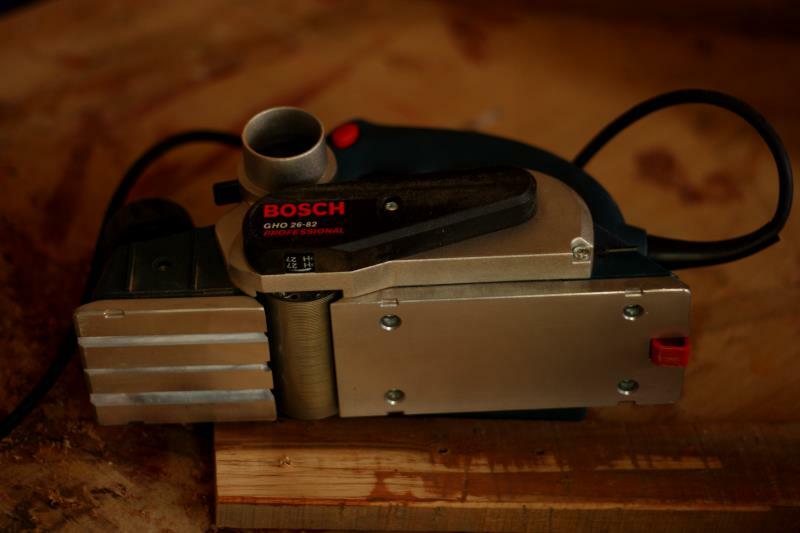 I suspect I will be using it a great deal like my belt sander, which does excellent service cleaning up joints, flattening panels and of course coarse sanding. However, I feel the planer should not be considered a precision tool. It is a roughing tool that makes it easier and quicker to flatten rough surfaces and to reduce stock to smaller sizes. For finishing nothing can beat a properly sharpened and tuned hand plane. Planer is one of the important power tool in woodworking business, because it gives best and smooth finishing. Manoj, from what I have heard Cumi is a good brand although I don't own any of their tools. I think it should be a good buy but you can never tell until you actually use one! I have and continue to face the same problem as you do. There is no short cut. The hand held planers are difficult to control and in my opinion are meant for rough work, mainly carpentry (house building and so on). However, if you are extremely skilful (which I cannot say I am) you could perhaps use the hand held planer for jointing. That said, a hand held planer would be useful for rough flattening of badly twisted or cupped boards. Ok.I will then buy this planer for rough cut/initial cut where lot of material needs to be removed.Then I will follow the current process what I am following now, a jointer(shobha 22")/Jack(shobha 5-1/2) and then smoothing plane. That is most unfortunate but you should have a warranty on the planer. 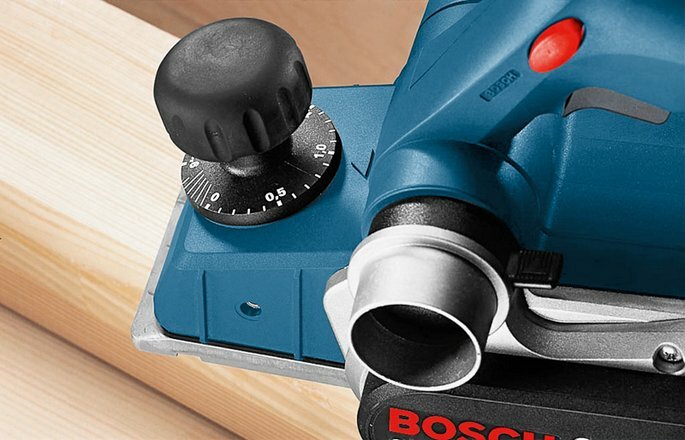 Search the bosch India power tools site and connect with your nearest service centre. They should be able to fix it.